In a series of tweets Thursday night, Musk wrote SpaceX retrieved both halves of the Falcon Heavy’s payload shroud from the sea, and the hardware appears undamaged after riding to the edge of space and back. Musk said the fairing halves will launch again later this year on a mission carrying a batch of satellites into orbit for SpaceX’s Starlink global broadband network. Two Starlink test satellites launched last year, and SpaceX’s next set of Earth-orbiting broadband relay spacecraft are scheduled for launch on a Falcon 9 rocket from Florida in the coming months, according to regulatory filings. 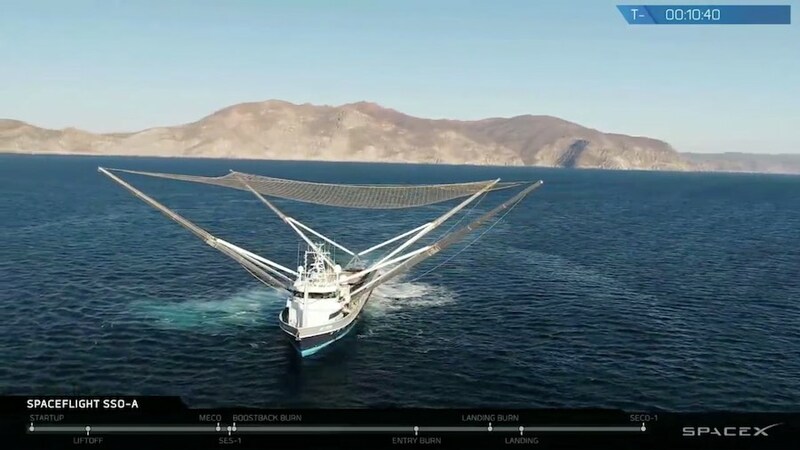 On several missions since early 2018, SpaceX has tried to catch the payload fairings using a giant net on a ship named Mr. Steven, which tried to maneuver under the fairing as it descended under a steerable parachute. After several near-misses, SpaceX installed a bigger net on the vessel, but the company has not yet snatched a fairing using the ship. 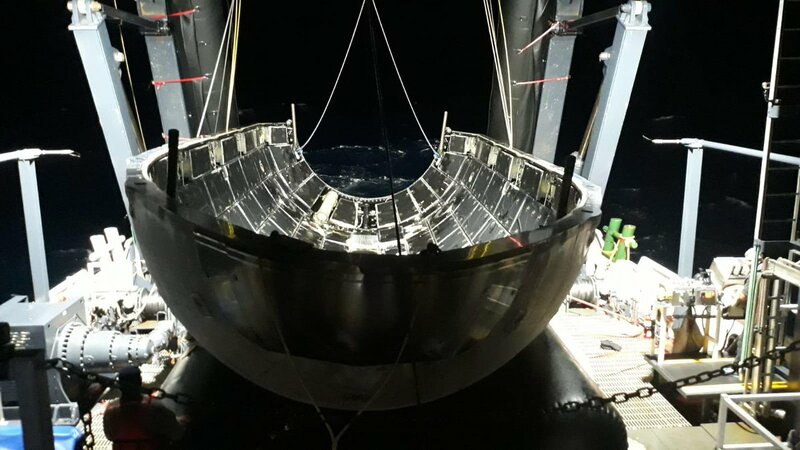 SpaceX has recovered numerous fairings from the ocean. The concept of catching the fairing with Mr. Steven was intended to keep the hardware from being damaged by salt water. SpaceX’s experience with refurbishing Dragon cargo capsules that splash down at sea has shown the effort to be time-consuming. In recent months, Musk has said cleaning fairings recovered from the ocean may not be a show-stopped to reusing the shroud. Musk said Thursday night that the fairing halves from the Falcon Heavy launch Thursday will be the first to be re-flown. The payload fairing typically jettisons from the rocket three or four minutes after liftoff, once the launcher has climbed into space. The aerodynamic shroud, or nose cone, shields satellite payloads from the airflow as the rocket ascends through the dense lower layers of the atmosphere. Once in the vacuum of space, the fairing is no longer needed. It separates in two pieces, like a clamshell, and falls back to Earth. The fairing used on Falcon 9 and Falcon Heavy launches is about 43 feet (13 meters) long and 17 feet (5.2 meters) in diameter. 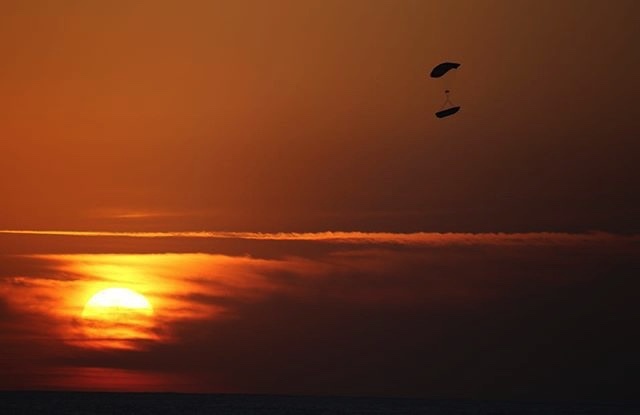 SpaceX has outfitted its fairings with avionics, thrusters and steerable parachutes to aid recovery. The company wants to reuse the fairing, eyeing it as the next step after proving the landing and reuse of Falcon booster stages. Musk told reporters last year that the fairing costs around $6 million. He said the first stage of the Falcon 9 rocket comprises about 60 percent of the cost of a launch, with the upper stage responsible for 20 percent, and the fairing another 10 percent. The remaining 10 percent of the cost of a Falcon 9 mission come from charges stemming from launch operations, propellant and other processing expenses, Musk said last year.